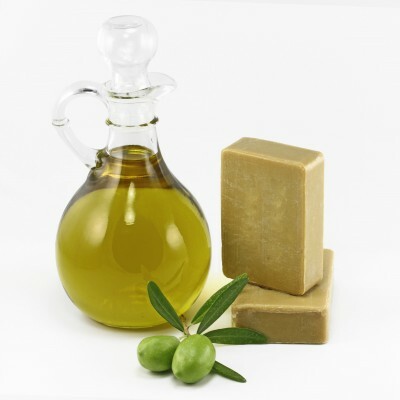 Anne Medlin, in her helpful little book, Natural Cleaning Made Simple, gives some helpful, easy recipes for cleaning our bathrooms. I don’t know about you, but I dislike a dirty bathroom and toilet area and am so fussy about squeaky clean toilet bowls and shower doors. I am often tempted to use a powerful thick bleach in order to get this done. 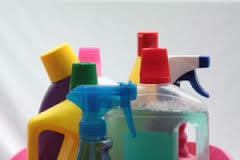 But, there are some wonderful recipes for natural cleaning products. They may need a little extra elbow grease, but it gets the job done beautifully and you will have contributed to keeping our water system a little healthier. Turn off the flow valve to your toilet. Flush a couple of times to make sure the water in the toilet bowl is totally drained. Sprinkle the Bicarb in the bowl, covering as much of the surface as possible. Pour the vinegar into the bowl, over the bicarb. These two ingredients create a chemical reaction which I enjoy watching every time. Once the explosion has settled, add the essential oils and allow the mixture to sit for 10-15 minutes. 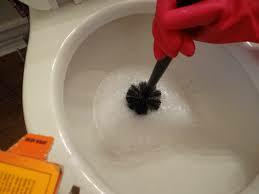 Scrub the bowl with your toilet brush, turn the faucet back on and flush the mixture away. The result is a clean, shiny toilet bowl. Have fun making these recipes.